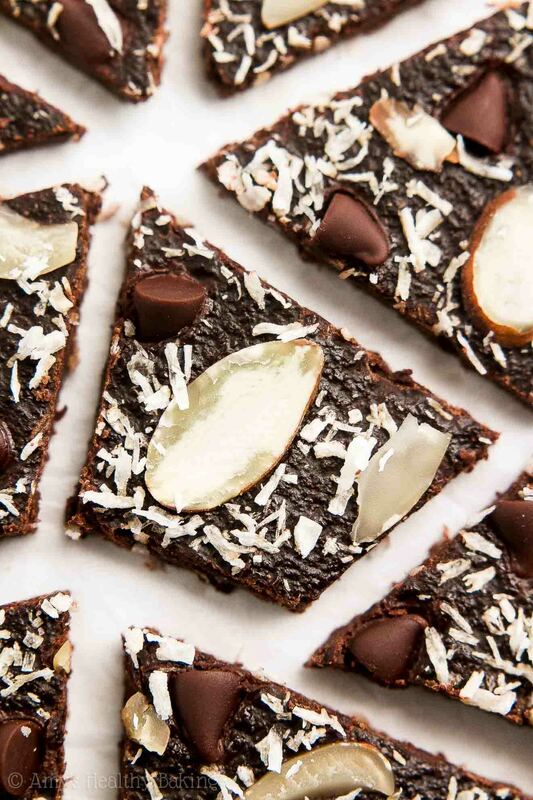 Learn how to make healthy homemade brownie bark with this easy recipe! It’s rich & fudgy, even with no refined flour or sugar, and only 69 calories! During the end of March when I walked out to the street to wheel in my trash and recycle bins in the evening, I spotted my neighbor and her little daughter sitting on the curb. We waved, and the girl ran over to give me a huge hug. I asked about their recent trip to Arizona to visit family, and the mom shared that while they had a great time visiting with her in-laws, her daughter actually felt pretty homesick for their house and her toys by the end of their stay (hence the huge hug—she was thrilled to see everyone and anything familiar!). Always polite, the mom then inquired about my week, and I mentioned that I had flown home for 24 hours just to go to the Oakland A’s opening day baseball game with my parents. She smiled and said she had grown up an A’s fan too and went to games all the time with her dad during her childhood—and her hometown was barely half an hour away from mine! The following week, her spouse texted me and revealed they had a little surprise for me. When I stopped by, they handed me a small wooden sign with a message painted on the front: In baseball, as in life, the important things happen at home. How sweet is that?? It’s now sitting right next to my desk! Of course, I immediately wanted to share something with them in return… And since they’re chocolate fans (especially their daughter! 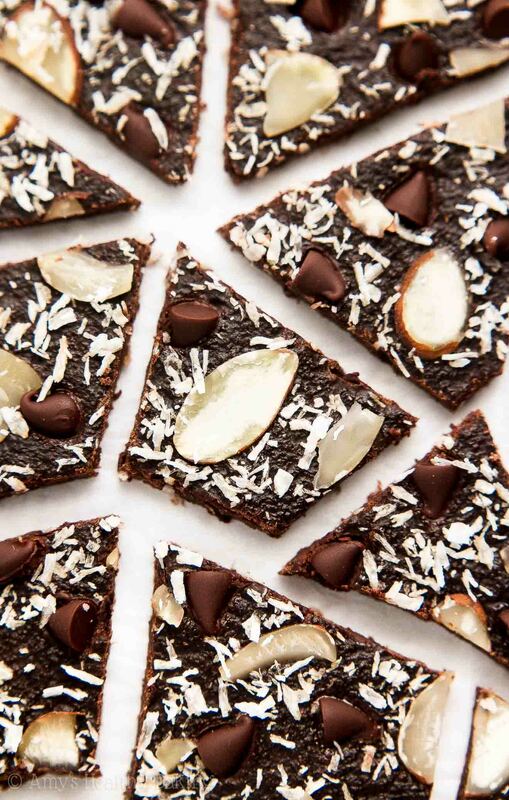 ), I brought over this Healthy Almond Joy Brownie Bark as a thank you! It tastes really rich and chocolaty, and the shredded coconut and sliced almonds make it taste like the popular candy bars. 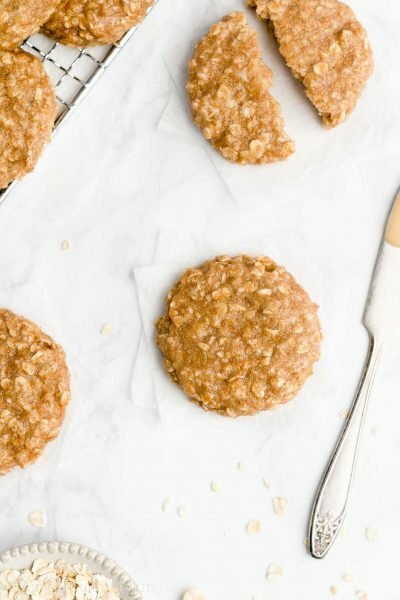 Yet this healthy dessert contains no artificial ingredients, refined flour or sugar—and only 69 calories! 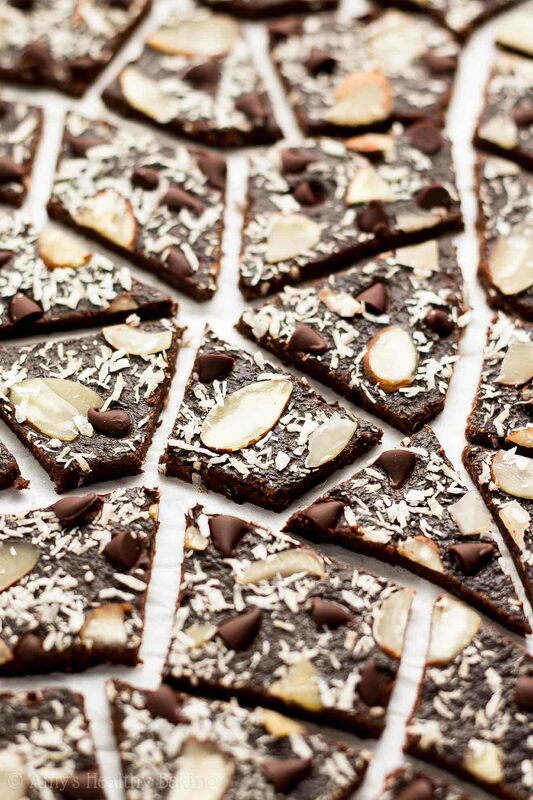 Let’s go over how to make this healthy homemade brownie bark! You’ll start with white whole wheat flour (like this!) and cocoa powder (like this!). White whole wheat flour is made by finely grinding a special type of soft white wheat (hence the name! ), whereas regular whole wheat flour comes from a heartier variety of red wheat. They both have the same health benefits, but white whole wheat flour has a lighter taste and texture—which lets the rich chocolate flavor in this healthy dessert really shine! 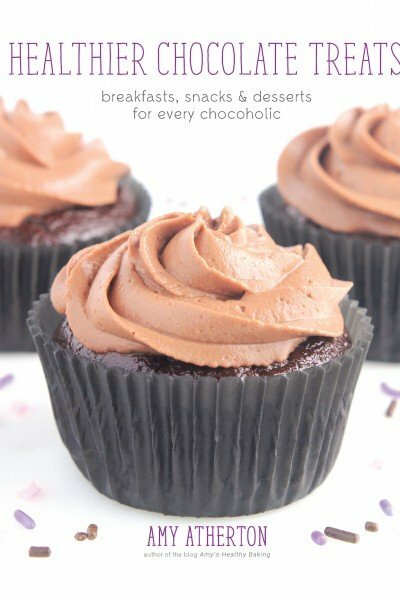 You just need regular unsweetened cocoa powder, like this! I don’t recommend Dutched or special dark cocoa powder in this recipe. Both of those have duller, more muted flavors, which means your brownie bark won’t taste as rich and decadent. This is the cocoa powder that I use! Remember to measure the flour and cocoa powder correctly, using this method or a kitchen scale. (← That’s the one I have!) Too much of either will make your brownie batter dry, and too much cocoa powder will also make your brownie thins taste bitter. This healthy brownie bark uses a lot less butter or oil than traditional recipes: only 1 teaspoon! The rest of the pieces’ fudgy texture comes from Greek yogurt. 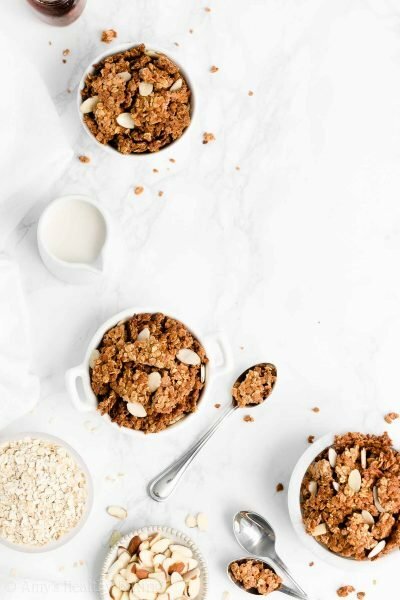 If you’ve read my blog before, you know how much I love incorporating Greek yogurt into my healthy baking recipes! It adds the same moisture as extra butter or oil for a fraction of the calories, and it gives your treats a big protein boost, too. You’ll skip the refined sugar and sweeten your healthy brownie thins with pure maple syrup instead. Use the real kind, like this, that comes directly from maple trees! Skip the pancake syrup and sugar-free syrup; those usually contain artificial ingredients and don’t produce the same texture. Now that your brownie batter is done, it’s time to spread it on a silicone baking mat (like this). I use an offset spatula (like this!) because it makes the process easier than using a regular spatula or knife… And it creates a more even layer too! Ready for the almond joy toppings? 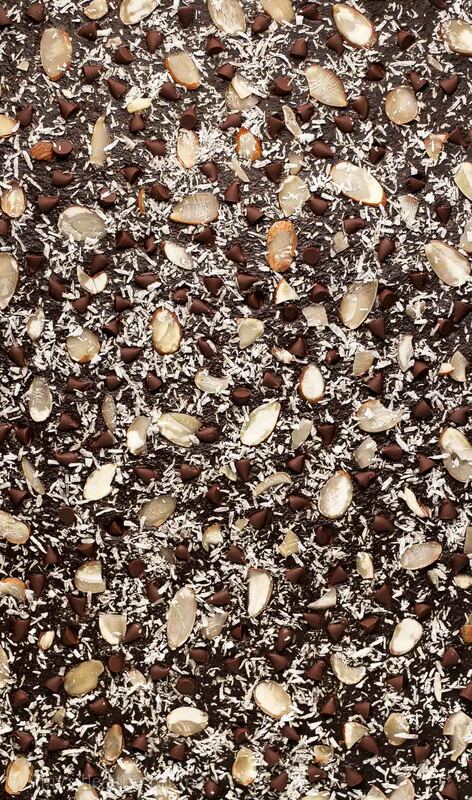 You’ll sprinkle on sliced almonds (like these), mini chocolate chips (these are my favorite! ), and shredded unsweetened coconut (like this!). All of those candy bar flavors + brownie bark = a match made in heaven! Wait until your brownie bark completely cools to room temperature to slice it! I know it’s really hard to wait that long, but it allows the brownie layer to turn fudgy instead of cakey. 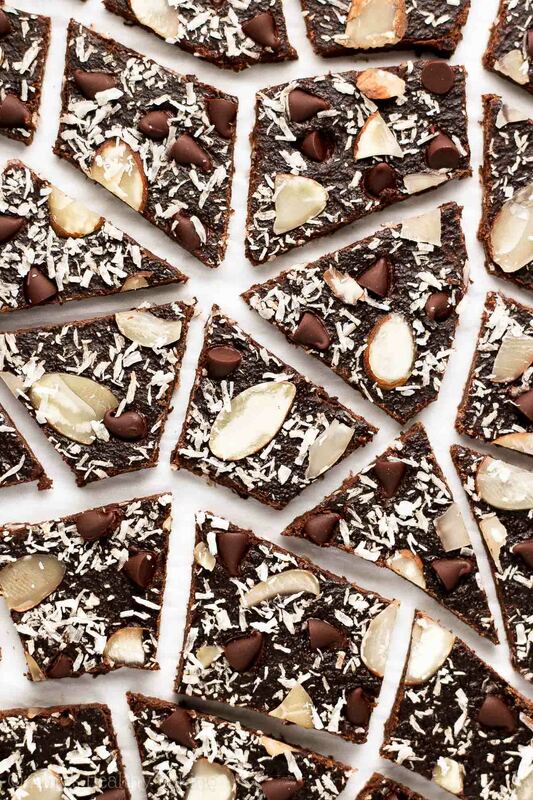 You can cut the brownie bark into regular ol’ squares or fun shapes—it’s totally up to you! 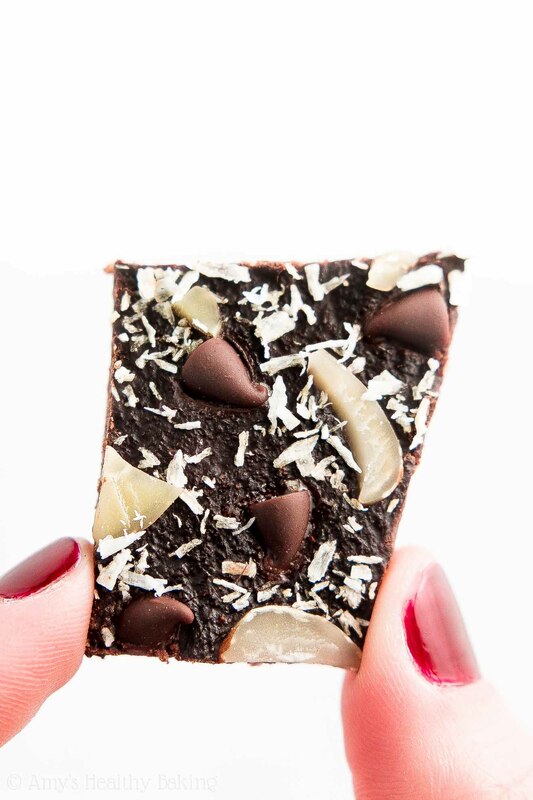 How tempting does this healthy homemade brownie bark look?? And when you make your own, remember to snap a picture and share it on Instagram using #amyshealthybaking and tagging @amyshealthybaking IN the photo itself! (That guarantees I’ll see your picture! ?) I’d love to see your brownie bark! This homemade brownie bark is always a huge hit! It’s fudgy like my favorite brownies, tastes so rich and decadent (similar to 72% dark chocolate), and the fun toppings make it taste like the popular candy bars. 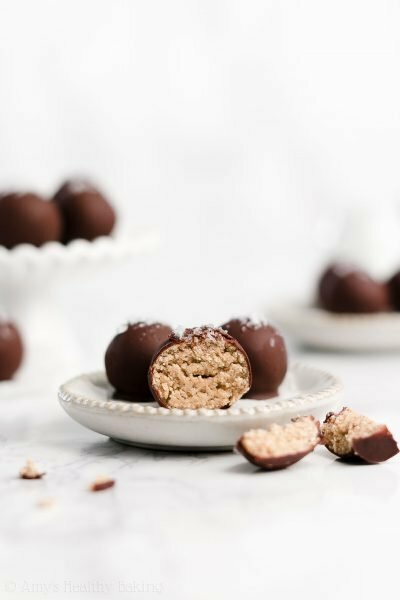 (Almond Joys are my mom’s favorite, so she’s in love with this recipe!) Leftovers will keep for at least one week if stored in the refrigerator in an airtight container or zip-topped bag. Preheat the oven to 300°F, and line a baking sheet with a silicone baking mat (highly preferred!) or parchment paper. Spread the batter onto the prepared baking sheet in an even layer ⅛” thick. (An offset spatula like this really helps!) Sprinkle the sliced almonds on top first, followed by the miniature chocolate chips, and ending with the coconut. Gently press the toppings into the brownie batter with your hands. Bake at 300°F for 11-13 minutes. Cool completely to room temperature on the baking sheet, and let the brownie bark sit for at least 3 hours at room temperature before slicing. Notes: For the gluten-free flour, use as follows: ¼ cup (30g) millet flour, 2 tablespoons (15g) brown rice flour, 2 tablespoons (15g) tapioca flour, and ¼ teaspoon xanthan gum. Most store-bought gluten-free flour blends (like this one!) will work as well, if measured like this. I don’t recommend using Dutched or special dark cocoa powder. The brownie bark already tastes very rich and dark chocolaty without it! Make sure you measure the cocoa powder correctly using this method or a kitchen scale (← that’s the one I own and love! ); too much will make this brownie bark taste bitter. These are the sliced almonds that I used. Shredded sweetened coconut may be substituted for the shredded unsweetened coconut. You can easily add more of the toppings if you’d like! Thanks so much! It sounds like you and my mom would definitely get along — or fight over all of the Almond Joys at Halloween! 😉 She’s obsessed with Almond Joys too! I really want to try these! 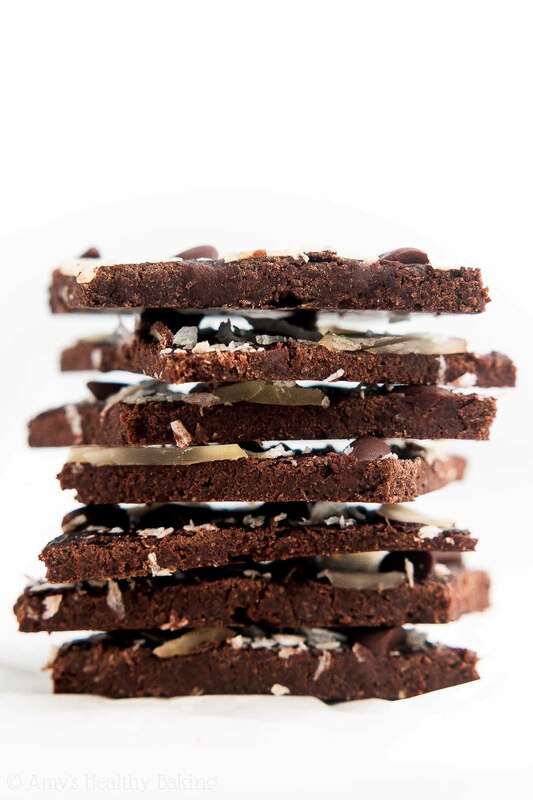 One question-you describe them as fudgy, but most brownie bark is crisp… So are these crisp too? Sorry if that seems like a dumb question! My hubby is a BIG fan of fudgy brownies only! Not a dumb question at all Jessica! This brownie bark is chewy and fudgy — not one bit crisp or crunchy! 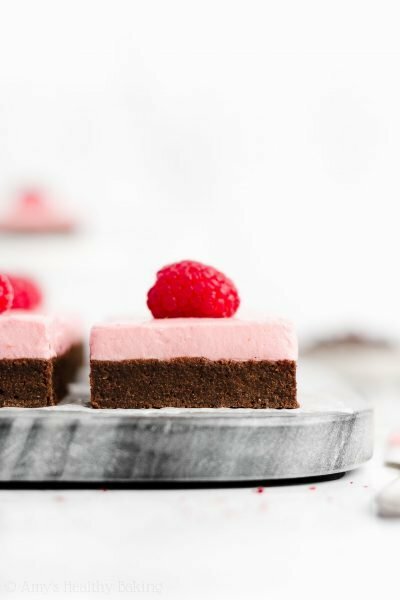 🙂 I’d love to hear what you and your husband think if you try this brownie bar! 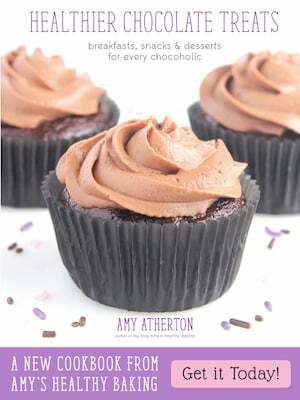 Hi Amy, for how long can these brownies be stored outside refrigerator?